A couple of weeks ago, my friend, Sara, went to Iceland for a vacation. I had asked her if she would bring me back a couple of beers from there to try for this blog. She did one better, bringing home 2 beers from Vífilfell and another 2 from Viking brewery. Wow! Thanks, Sara! So this week I am doing the two beers from Vifilfell, the Islenskur Urvals Pils and the Islenskur Urvals Stout. In doing some research on this, I was surprised about the history of beer in Iceland. Why? Because up to 1989, beer was actually banned in Iceland. 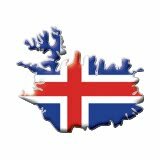 Early in the century, Iceland held a public referendum which came out in favour of prohibition, starting January 1, 1915. It was partially lifted in 1921, when Spain threatened to stop buying Icelandic fish, unless Iceland bought Spanish wine. So wine was allowed. In 1935, another national referendum was held which voted in favour of legalizing liquor. Beer was not part of the referendum. So liquor and wine was allowed to be drank but not beer. Seems like a strange decision. I have heard of liquor bans where just beer was allowe d but not the other way. Seems that beer was not included in the referendum to please the temperance lobby who felt that "because beer is cheaper than spirits, it would lead to more depravity." In 1983, the first Icelandic pub, Gaukur á Stöng, opened. They had an interesting trick. They would take non-alcoholic beer and add Brennivin, also known as Black Death, and is a 40% ABV distillation of potatoes to create a fake beer. Finally on March 1, 1989, the beer ban was lifted. Now known as "Beer Day", the anniversary is celebrated each year on March 1st where the pubs stay open to 4am and beer drinking abounds throughout the land. As Iceland is far north and, in fact, touches the Arctic Circle, they do need to import their malt and hops. The water, though, is very pure and soft like the water in Czechoslovakia. The water is filtered but chemicals are not needed as the quality is so pure. Now time to crack my first bottle. Islenskur Urvals Pils: This is Iceland's very first certified organic beer and received its certification just this past summer. It is brewed in the traditional Czech method. The beer pours with a large white head that held well. Lots of lacings lined the glass as it slowly emptied. The beer is straw-coloured and very clear. The beer was very carbonated, which is why the head held so well. And the taste? There was a very nice hoppiness throughout, well-balanced, strong but not overpowering. It has a good bitter finish, one that disappears quickly. With only 21 years of experience in brewing and having to import their hopes, they sure have learned how to use them properly. This is a very nice pilsner. I have always hoped to visit Iceland one day and when I do, I will be looking for this on tap. Islenskur Urvals Stout: This beer pours black with a brownish head. Once again, nice lacing line the sides of the glass. The beer surprisingly only has a light aroma, but in the aroma is a sense of coffee from the malted barley. Coffee flavour is very apparent throughout and the finish tails off more like a porter than a stout. Although the alcohol is listed at 5.8% APV, this is not a heavy beer to drink. From the taste and feel, I would have put it at 4%, which makes this a fairly dangerous beer as it is very drinkable and tastes like you could have a few. I enjoyed this beer and would not hesitate to have it again. Thanks again, Sara! So far I am very impressed with Icelandic beer. Note: What is an Islenskur? 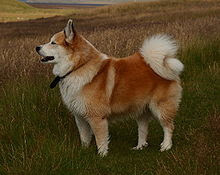 Isenskur is an Icelandic Sheepdog which was brought to Iceland by the Vikings. Interesting note, importing dogs to Iceland has been forbidden since 1901.